I was in the dentist chair in Gainesville, Florida when 9-11 happened. I never believed the "official story" and early on agreed to speak at conferences held in San Francisco and Toronto organized by the emerging 9-11 truth movement. For two years after 9-11, at every talk I did anywhere in the U.S., people would ask what I thought about 9-11 during the question and answer period. It was clear to me that many people also had grave doubts about the "official line" about the 9-11 attacks, even if they were reluctant to say so in public. Last night I went to Portland to listen to Dr. David Ray Griffin speak to nearly 100 people about the links between 9-11 and the war in Afghanistan. Griffin has written nine books on the subject and is a former professor at the Claremont (California) School of Theology. Griffin began with a detailed review of the illegality of the U.S. attacks on Afghanistan following 9-11. He acknowledged that most American people are still unaware of the illegality of this war. And, he said, "Obama has taken over the Bush-Cheney account of 9-11" as witnessed in his West Point speech some time ago. Griffin reminded us that the Bush administration was "prepared to bomb Afghanistan two months prior to 9-11." This was after the pipeline deal between Unocal and the Taliban had broken down. In July of 2001, in Berlin, the Bush team demanded that the Taliban agree to allow construction of pipelines to move Caspian Sea oil and natural gas through their country. They were told they could have either a "carpet of gold or a carpet of bombs." Next Griffin reviewed the 9-11 Commission Report that admitted they had no success in gaining any evidence of Osama Bin-Ladin's involvement in 9-11." The FBI also acknowledged it had "no hard evidence" of his role either. Griffin maintained that 9-11 was a "false flag operation" in order to create the political support for expanding U.S. bases in the Middle East and Central Asia, massive increases in military spending, and development of new war fighting technologies. He spent considerable time documenting the controlled collapse of Building 7 which was not hit by planes on 9-11. Bldg 7 was 47 stories tall and only had fires on six floors. FEMA, Griffin said, has acknowledged it had no explanation for the collapse of Bldg 7. In order for such a controlled collapse of Bldg 7, 82 steel columns had to fail simultaneously for such an implosion to occur. This was only possible with the use of explosives such as nano-thermite which is not commonly available. In order for iron to melt, the temperatures would have to reach at least 2,800 degrees and normal office fires at most reach 1,800 degrees. Government reports suggested that "fires of office furniture" inside Bldg 7 caused the implosion. This is obviously ridiculous. The organization Architects & Engineers for 9-11 Truth, made up of about 1,200 professionals, has done much work to debunk the mythology surrounding 9-11. They have repeatedly shown that steel frame buildings worldwide have never collapsed due to fires and that Bldg 7 could have only been brought down by high explosives. "Who would have the kind of access to these three buildings for such an operation? ", Griffin asked the audience. "Millions of people have died because of the big lie of 9-11," Griffin concluded. Sixty percent of the 9-11 responders (fire, police, rescue squads) have serious illnesses today from the toxic dust they inhaled. More will die from the rescue and clean-up operation than on 9-11 itself, he stated. "Democrats have been as bad as Republicans for centuries" when it comes to American imperialism, Griffin said, as he recounted past examples of U.S. government false flag operations. One question from the audience was, "What do we do?" Griffin acknowledged that it was the most difficult question to answer but said that in the end we must be able to say that we stood up and raised questions and organized when many feared doing so. Europeans are increasingly becoming more critical of the official story Griffin reported, including media there now willing to openly discuss 9-11. In the end, he concluded, "We don't give up." "Physical laws contradict official theory," Griffin said several times throughout his talk. You can't argue with the science that absolutely proves that the collapse of Bldg 7 was a premeditated operation that was beyond the capabilities of Osama Bin-Ladin. There are so many holes in the official story that it looks like Swiss cheese. To activists like me, who have seen the expansion of endless war and massive funding for military space technology since 9-11, I feel a moral and ethical responsibility to fix my glare on the reality of the collapsing buildings and destroyed lives and ask the basic and fundamental questions - why and who? I Forgot To Say: Griffin called for a new investigation of 9-11 suggesting the $11 million official one was a complete bust. He reminded us that the space shuttle Challenger investigation some years ago cost $50 million. The Rainbow Boy is an allegorical tale about the consequences of loss of culture and human devastation of planet earth. The story tells about an ancient Navajo warrior, Eagle Catcher, who enters a sacred cave despite an ancient prophecy that warns against entering the cave. Eagle Catcher is transported to the future, which is our own present, where he sees and lives the prophetic devastation of modern humans. His arrival profoundly affects young Ozzie Yazzie, a modern Navajo punk kid struggling to understand his own identity and culture. Almost dying, Eagle Catcher is assisted by his Navajo people, who take him back to the holy cave. Upon returning to his own time, he is given four prophecies about the dire consequences of human choices and actions for the future of planet earth. The Rainbow Boy is groundbreaking in that it was written by a Navajo, is directed and produced by a Navajo, and has an entirely Navajo cast. It's also shot almost entirely in the Navajo language, with subtitles. THE RAINBOW BOY is still in post production. Completion date is June 2010. WHY ARE AMERICANS SO QUIET? I took our guest Narayana Rao, visiting from India, to the Maritime Museum in Bath today. He was most struck by the fact that this once great commercial ship building city now only builds Navy Aegis destroyers. We took the city bus to the museum but then walked past the Bath Iron Works (BIW) shipyard on the way home. As we walked by we saw another multi-billion dollar destroyer being built. It was in this moment that Rao said, "I can see that America builds nothing else but weapons. And to make sure that they can build more, they must have more wars." We had a pot luck supper in Rao's honor at the house tonight and one of the folks asked him what he thought of the museum. He responded, "I was very depressed when I left the museum today. America can never have the democracy it claims to have as long as your country keeps building weapons." In the discussion after dinner Rao also noted that he sees very little reaction on the part of the American people to the loss of democracy, endless war, and the destruction of social progress across the nation. He said that it was evident to him that the media is suppressed and that the public has few options to get real debate about alternative ways of dealing with our many problems. Why though are the people not reacting, he asked? Why are there not more protests? Maybe the answer was in his initial reaction to our city of 10,000 people here in Bath. He said that in India people would think everyone in Bath is rich. Even though the working-class community of Bath has one of the highest poverty rates in Maine, people are still relatively comfortable in comparison with the 300 million people living in poverty in India. Americans know we have our collective "boot" on the necks of the people of the world so that we can extract resources from them. In the U.S. we are 5% of the world's population but consume 25% of the planet's resources. In order to continue that disparity someone must suffer. Americans have convinced themselves that the Pentagon's "boot" brings democracy and freedom to the world. That is how we rationalize it. The American people have been brainwashed to believe in "exceptionalism" - that we are better than everyone else - that we deserve to control the world because we are #1 .... gods chosen people. This kind of thinking is malarkey but many people still believe it. Rao's visit here has already helped many of us to put on another set of glasses and view ourselves from a different perspective. It's not a pretty picture. * Just back from New York City yesterday afternoon with much to catch up on. Feeling a bit groggy. Might be a second cup of tea morning. The sun is shining and the temperature outside more to my liking - cool. A beautiful Maine day. Our guest Rao has gone for a walk to the local library. Housemate Karen will take him for a ride out to the ocean today while I try to get my backlog of work done. 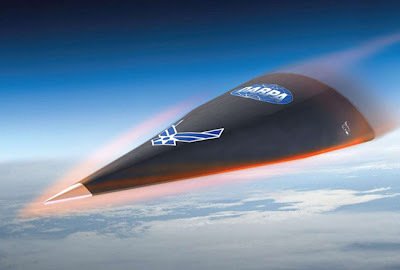 * Space News reports, "The U.S. Defense Department’s first test flight of a new hypersonic glider ended abruptly as communications with the vehicle ceased mid-flight, a setback in the Pentagon’s pursuit of a highly precise long-range strike weapon. The Defense Advanced Research Project Agency (DARPA)’s Falcon Hypersonic Technology Vehicle (HTV)-2 program is one of three designs in the running to serve as the basis for the Conventional Prompt Global Strike weapon the Pentagon wants to build in order to hit a target anywhere in the world within an hour with a non-nuclear munition. The first of three planned HTV-2 flight tests took place April 22." "The administration of U.S. President Barack Obama has made clear its intention to maintain the nation’s strategic deterrent while reducing its dependence on nuclear weapons. As such, the New START nuclear arms reduction agreement signed with Russia on April 8 will not constrain any current or planned conventionally-armed ballistic missiles, according to an April 8 fact sheet posted on the U.S. State Department’s website." The cost of this week's HTV test and a follow-on in 2011, together is $308 million. Your tax dollars in action enriching the aerospace industry and likely ensuring a new, expensive, arms race in space as Russia and China (who clearly understand they will be the targets) feel they must respond. * I got an interesting email the other day about Obama's effort to privatize NASA and "civilian" space operations. The article, by Steve Zeltzer, reports, "A full bore campaign is now being waged by the Obama administration to shutdown the U.S. unionized space program and turn it over to 'new age' speculators who want to build a new space program in a 'regulation free zone' in Florida. A key player in this plan is billionaire and former owner of Paypal, Elon Musk." Musk, has set up SpaceX (Space Exploration Technologies Corporation) which appears to be on the way to running a taxi service for American astronauts. This is just another step toward eventual turning "ownership" of the planetary bodies over to corporations who envision making untold riches from mining the sky in years to come. You, the taxpayers, have paid the technology start-up costs and now the corporate elite will stand to make zillions in profits and pay little back in taxes. 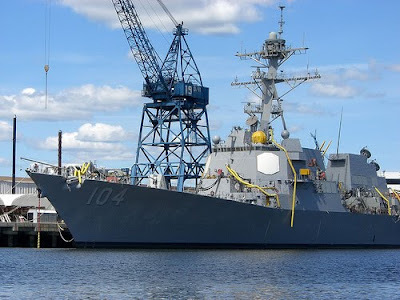 * Yonhap News reports, "South Korea's first Aegis destroyer will undergo a comprehensive evaluation of its fighting capabilities near Hawaii in June, a Navy source said Monday. "The source said Sejong the Great will conduct tests while taking part in the multinational Rim of the Pacific (RIMPAC) naval exercise. Lockheed Martin -- the developer of the Aegis system -- and U.S. Navy experts will act as observers and evaluate the weapons systems during the trial." This is an indication that the South Korean Navy is now being fully integrated into the command structure of the U.S. Navy and that the Aegis destroyers that would be deployed at the proposed base on Jeju Island will in fact be a part of the larger U.S. military strategy of surrounding China's coastal region in order to create the ability to choke off their importation of oil via ship. * I head back to NYC on May 7 for a couple more international meetings including the Global Network annual meeting on May 9. Dan La Botz is a prominent labor union activist, academic, journalist, and author in the United States. He was a co-founder of Teamsters for a Democratic Union (TDU) and has written extensively on worker rights in the United States and Mexico. His writing appears frequently in Against the Current, Counterpunch, Labor Notes, Monthly Review, New Labor Forum and Z Magazine. He is the editor of Mexican Labor News & Analysis. I was out early this morning and took the subway north to 125th Street in Harlem. There gathered about 100 people (25 of whom were monks and nuns from the Nipponzan Myohoji Buddhist order) from the four different peace walks that merged onto New York City in time for the peace conference and today's march and rally. The combined peace walkers headed south on 1st Avenue all the way to the United Nations - about 85 city blocks in the intense heat and humidity of the day. As we passed through Harlem, black and Hispanic people greeted us in an open and friendly way. They stopped respectfully as we passed by, many people looked out of the rows of public housing apartment towers and waved to us once they got an idea what all the drumming and chanting was about. People flashed smiles and peace signs. The old black women, dressed for church with their big summer hats, nodded in a way that showed they understood the spiritual nature of the peace walk. After about 20 some city blocks we left Harlem and moved into the predominately white community. There the response was much different. Many of the white folks, with their ipods plugged into their ears were jogging by and didn't bother to look at us, or they rushed past (and sometimes even through) our walk. Blank looks on their face were quite common as they erected a sentry tower around their emotions. I had the thought that it was like the peace walk was a lovely rare flower in the desert and these people didn't have the "time" or the inclination to notice. Some even looked dead inside. Of course I am generalizing, there were some exceptions in the white community, but by and large there was a world of difference in how the people - just 20 city blocks apart - viewed the walk. After the walk arrived at the U.N. the walkers were invited into the church center just across the street from the U.N. where an inter-faith service was held. I went and had lunch with two dear friends who are here from Santa Monica, California - Cris Guiterrez and Randy Ziglar. Whenever I am in Southern California, I always stay at their home and sleep on their small apartment living room floor. Randy is a retired beach lifeguard and a great organic urban gardener, and Cris, a longtime worker in the public school system, recently lost her job due to fiscal crisis in their state. They took the train across the U.S. to come to New York City. After lunch we wandered down to Times Square where the rally was to be held. Much to our surprise the rally was spread out over about 4-5 blocks with one lane of traffic barracaded off and the 10,000 or so peace advocates were spread along this long line and had to sit on the hot road pavement for over three hours before the official march to the U.N. began. They had a good sound system set up with powerful amplification along each block but the heat made the wait difficult. The good thing though was that as new people arrived they had to walk along the sidewalk past the long string of caged protesters (most of whom seemed to be from Japan or from Europe) - Americans seemed to be vastly outnumbered. But sitting there for that long I was able to see many friends pass by which helped make the hot wait bearable. Finally just after 4:00 pm the march began and it took about an hour to make our way back to the U.N. where the march ended and organizational tabling and music was going on. By that time I was physically drained from the heat and the long day of walking. The first thing I wanted was something cold and fruity and I went inside the first store I found to buy a popsicle. I figured I had earned the delicious treat. In the morning I head back to Maine on the train and bring Narayana Rao from India with me for a few days. 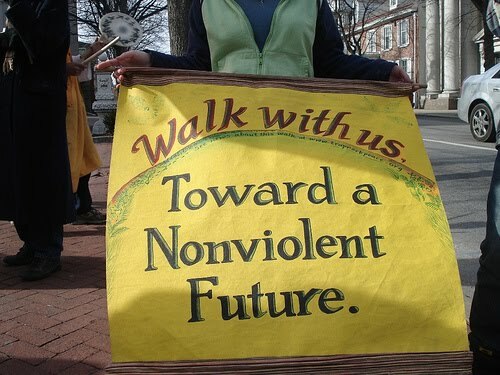 Teach-In on Capitol Hill on Ending U.S. Wars from William Hughes on Vimeo.